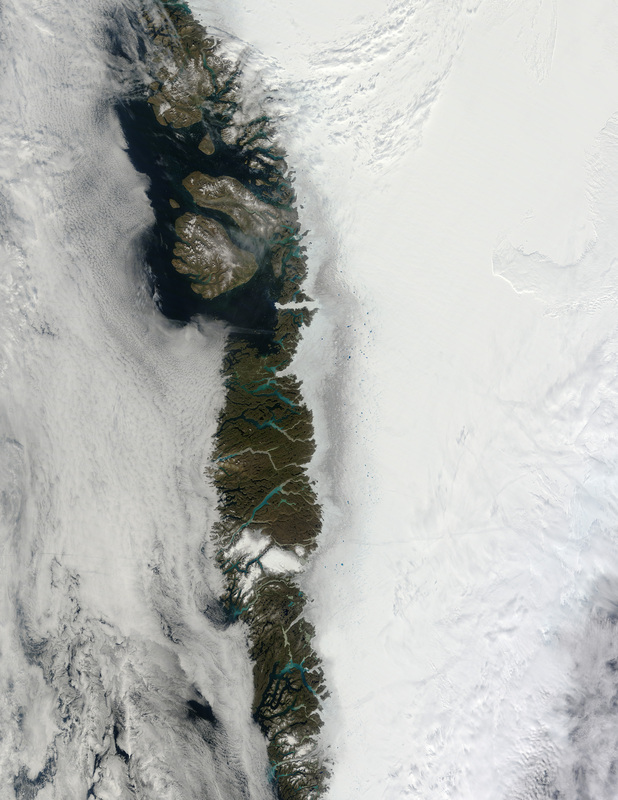 Snowfall summer 2014 for south Greenland would have kept the melt rates down by brightening up the surface. Summer 2014, at the PROMICE.org QAS_A site, we recorded ice loss from the surface at a place we thought was above equilibrium line altitude, where the surface would lose no ice in an ‘average climate’. The higher than normal melt rates allowed the impurities to concentrate near the surface in a process documented for snow surfaces by Doherty et al. (2013). To avoid misinterpretation, black carbon is only part of the darkness, the rest is dust and microbes (See Dumont et al. 2014 and Benning et al. 2014). The photos are from the lowest part of the ice sheet’s elevation. The upper elevations do not get nearly this dark. This satellite image illustrates for west Greenland how dark the surface gets, down to 30% reflectivity. Doherty, S. J., T. C. Grenfell, S. Forsstro¨ m, D. L. Hegg, R. E. Brandt, and S. G. Warren (2013), Observed vertical redistribution of black carbon and other insoluble light-absorbing particles in melting snow, J. Geophys. Res. Atmos., 118, 5553–5569, doi:10.1002/jgrd.50235.